After all is said and done, I have no regrets for anything I have done in my life, because it has made me who I am. Can you do the same? Can you live your life with no regrets? I have traveled extensively around the world, owned my own businesses , bought and sold homes, raised two daughters, had many lovers and accomplished many goals. 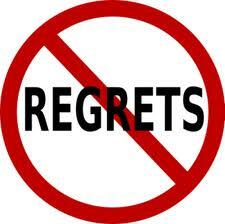 I have not done things perfectly and have made many mistakes along the way, however, I have no regrets. I did the best I knew at the time, improve and become more aware as I journey through life. I love life and to live it with gusto I choose to release any guilt, and have no regrets. So I continue to set new goals for myself, to aspire higher and to give life all it has giving me which is opportunity to grow and thrive. I feel blessed to have this awareness which came to me because I never gave in or up. Of course I had times of sadness, loneliness, victim hood and all those negative feelings. I over came them by always searching for the truth and marching forward even when I didn’t feel like it. Now I can look back on my life with no regrets and move forward to accomplish so much more. Because at the end of my life I will never say I should have, would have or could have! I could have been a contender. I want to play in the game of life and have absolutely no regrets!